I found a bunch of recipes calling for whole grains and beans I had never heard of when I first started reading through vegan cookbooks (yes, I’m geek enough that I actually sit down and read a cookbook). I found quite a few of them at Nutrition S’mart, but I think that store is on the pricey side. I’ve read enough to know that incorporating whole grains in to my diet is a good thing. And I’m one of those people that needs variety in life. I get bored eating the same type of food day after day. I also love trying new foods. So, I did what I normally do when I get curious about something: I went on-line and searched. I found a number of websites that sold the same type of grains and beans either cheaper than I could get them locally and/or in bulk. They usually offered organic versions as well. And those sites sold even more varieties of grains and beans than I had seen in my cookbooks. Some even had heirloom beans and rice! Who ever heard of heirloom rice? I hadn’t, but I did now and I couldn’t wait to try it out. 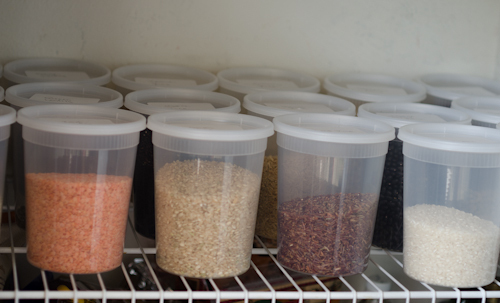 Grains and dried beans don’t need refrigeration, so buying a bunch of different kinds on-line is a great way to keep a well-stocked pantry with items you don’t normally see in stores locally without worrying that they’ll go bad before you have time to eat them. I usually order one pound each of five or six different kinds of grains and/or beans at the same time. This not only keeps a diverse and well-stocked pantry, but it also helps lower my shipping costs. At first I just kept them in the plastic or paper bag-type containers they came in, but it made organizing my pantry practically impossible. Then I found these plastic containers on Amazon. They are the same large containers that chinese restaurants use as take-out containers for their soups. They came in a package of 24. I discovered that each container easily holds a pound of either grains or beans. I also discovered that a pound of flour is a bit more in volume than a container holds. Oh well. Now I have some motivation for doing a bit more baking to get rid of that little bit of flour that I can’t fit in my containers. I also needed a way to identify the different beans and rices. I dug through my office closet (the one that accumulates junk that is still good but I don’t use and can’t bring myself to throw out). I found some old floppy disk labels (yes, floppy disks – they did exist not that long ago). I used those as labels and stuck them to the lids. Now they all stay nice and neat in my pantry and I can quickly see if I’m running low on any item. And I actually used all 24 containers and still had some beans needing storage, so I went back and ordered another box of containers. Anyway, below is a list of websites that I use for flours, rice, whole grains, and dried beans. There are three big pluses for me when ordering from these sites. Do you pay for shipping? Yes, but overall the price I pay on shipping is usually less than the money I saved from buying them at Whole Foods or Nutrition S’mart or my local grocery store. Below are the ones I currently use on a regular bases. I’m always looking for others, so I’ll add more links as I find them. If you have any recommendations, please let me know! This is run by a husband and wife. You can find their products on Amazon as well as their own site. I prefer to buy from them directly and eliminate any profit they may lose by selling through Amazon. They buy items in bulk and sell in smaller quantities. They also have some home-made canned goods that they offer. It looks to me like they pass on some of their bulk savings. Their beans tend to run between $2.89-$5.25 per pound, with the bulk falling in the $3-$3.50 range. The one anomaly is their Calypso Beans, which are priced at $8.39/pound. Their prices are about $1-$1.50 less per pound than Purcell Mountain Farms, but they don’t have near the variety of beans. I try and buy from both depending on what I need. I love these guys. They sell organic and fair trade products, most of them practicing sustainability. Most of their organic herbs are slightly cheaper than the ‘regular’ herbs I buy at my grocery store. They also offer ranges of discounts in quantities starting at 5 pounds. That’s a whole lot of herbs and spices and I haven’t met that quantity ranges yet, but it doesn’t bother me as I’m already getting savings. I can buy 4 oz of cayenne chili powder for $2.75. And it’s organic. Their herbs aren’t limited to cooking either. They also have a bunch of herbs used by herbologists like cats claw and burdock root. So if you are like herbal remedies or are interested in trying some, you should be able to find most of what you need at reasonable prices here. This is a family operated farm out of Idaho. 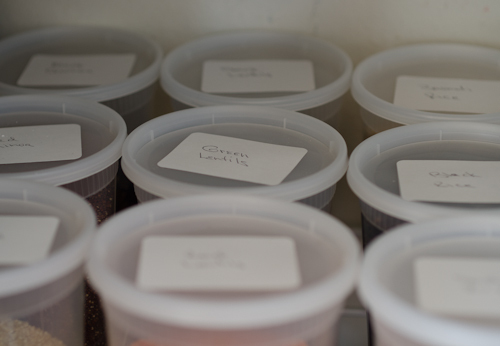 These guys have over 100 different types of dried beans. Just beans! I haven’t clicked on every one, but randomly went through them. From what I’ve seen, their prices range from $3.95-$5.25 per pound with the majority falling in the $4.50-$4.95 range. Their shipping charges range from $9.95 to $14.95 and are based on money spent, not location. So if you spend up to $25, you’ll be charged $9.95 in shipping whether you live in the same county as them or across the country. This is another family owned shop. They are located in Gainesville FL and only ship to FL and southern GA due to maintaining the freshness of their tempeh. The shipping area is very restrictive, I know, but if you are in that area they make wonderful, home-made tempeh. I buy 12 – 1 pound squares for a total of $65. That averages to about $5.40/pound of tempeh. And it’s all organic. I spend about that much on half a pound of tempeh at my local grocer. Each square is individually packaged, so I put them all in my freezer when they arrive and take them out one at a time when I want to use them.